The Non-Housewives: Thank You Delivery Drivers! 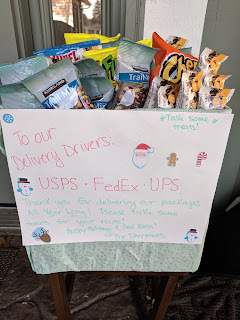 These men and women are working crazy long hours (and in some states, in freezing cold weather), so I thought it might be nice to leave them out some goodies for their route. I went to Costco and bought a variety of chips, granola bars and trail mixes, and put them outside my door with a note. To our Delivery Drivers: Thank you for delivering our packages All Year Long! Please take some treats for your route. Happy Holidays & God Bless! - The Shermans. Please feel free to steal this idea of you need to send a big THANK YOU to your delivery drivers - 'tis the season of giving! No service changes associated with the request will be implemented before May 15, 2012 (Source: United States Postal Service). lite blue AM General will build a series of prototype vehicles that seek to provide 'fuel efficiency and zero-emission capability.